A few weeks ago, I visited Swaziland, as part of a trip with World Rainforest Movement colleagues. We visited Sappi’s stinking, polluting Usutu pulp mill and drove through Sappi’s pine monocultures – FSC certified by Woodmark. Swaziland is a beautiful country. Unfortunately, it is afflicted by one of the most perverse “aid” projects anywhere in the world. 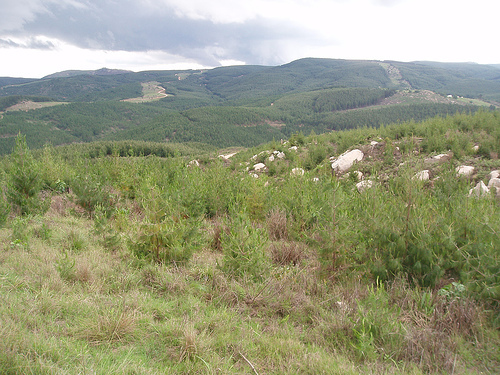 In the 1950s, planting of industrial tree plantations started with funding from the UK’s Colonial Development Corporation (now a private equity company). 50 years later it’s clear that establishing large scale industrial tree plantations and a pulp mill has failed to lift Swaziland’s rural population out of poverty. More than two-thirds of the people in Swaziland live on an income of less than US$1 a day. About one third of the people in Swaziland rely on food aid to survive. Nearly 40 per cent of the population is infected with HIV – one of the highest rates in the world. Life expectancy has fallen to 33 years for men and 35 for women. While we can’t put the blame for this entirely on tree plantations, the tree plantations are clearly not helping. While we were in Swaziland, we met Peter George, an Englishman who has lived in Swaziland since the late 1960s. We visited his small farm on a plot of land next to one of Sappi’s plantations, which Sappi refers to as Block X. For more than a decade he had no water on his farm and he stopped farming over a decade ago. He has started legal proceedings against Sappi. 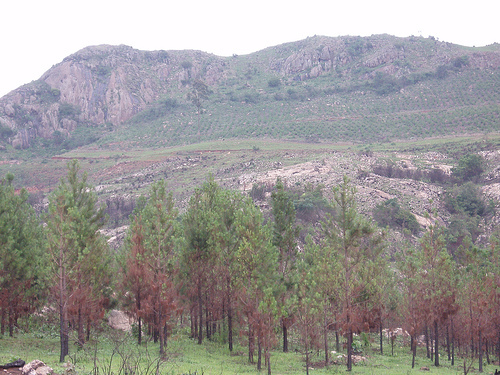 About seven per cent of Sappi’s plantations in Swaziland burned during 2007. Woodmark’s assessment team met Peter George in March 2006. They didn’t visit his farm and they didn’t meet him during the 2007 audit of Sappi’s operations in Swaziland. Neither have they answered his letter, one of which is available here. Peter George has written a short history of his farm and how he had to stop farming because no water was available. We’ve posted it below. It’s revealing to compare his version with what Woodmark wrote in the Public Summary of their assessment of Sappi. A stakeholder consultation was held with the owner of Elangeni Estate Pty Ltd on the 3rd of May 2006 at the Foresters Inn, Mhlambanyatsi. His farm of 79 hectares which borders onto Block X of Usutu Forests was bought in 1975 and is situated below the plantation. There are six streams that originate on Usutu land which flow through his farm. For the period 1975 to 1991 farming activities included the cultivation of vegetables, poultry, rain fed crops and trout. Due to the planting of pine trees since 1989 by Usutu Forests the natural flow of water in the streams was severely depleted. During August 2005 timber trucks using the road near the homestead caused degradation to the road surface. 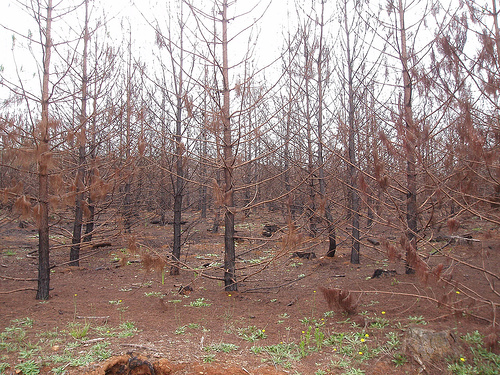 A fire which occurred during October 2005 crossed over from Usutu Forests to Elangeni Estates causing extensive damage on the farm. It was stated during the interview that the water flow in the streams is now back to normal.It was also stated that there has been a history of co-operation with Ustutu Forest as well, with regards to the fighting of fires. The issue regarding the reduction of water flow caused by the planting of trees and the subsequent claim is “sub judice” and is therefore under judicial consideration. And here’s Peter George’s version of the story. Elangeni Farm, place in the sun, consists of 80 hectares set in the cool highveld of western Swaziland. Blessed with good rainfall and moderate temperatures, Elangeni has supplied vegetables to the Swaziland capital since the 1940’s, or until 1990 that is, when the water just went away. This is the story of how it happened. Why it happened is yet to be decided. In 1975 Peter George bought the derelict Elangeni Farm from Government, and the slow process of creating a passable access road, building a homestead and laying on water began. The road was ‘fixed’ by using an old Land Rover, the house took a year to build, but water was easy: It ran right to the back door, through a big heated drum and into the house. From 1976 old lands were cleared, culverts put into streams and fences erected. One side of the farm is, or was joined by grassland pastures from which streams flow. Existing stands of gum and wattle trees provided firewood and a small income. A few sheep, a half blind sheep dog and two cows made it all look like a farm. And in 1980 the final essential arrived, a wife. 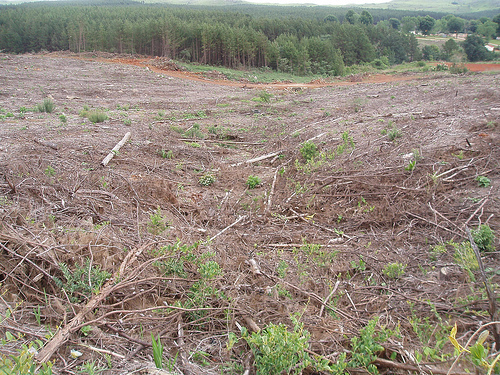 Growing timber on 80 hectares was not a prospect, nor was maize on the few lands. But water was plentiful, and vegetables looked promising. The only supermarket wanted vegetables, and later chickens, jam and marmalade. Cabbages looked good, with cool summers and a ready market. So the rocks were dug out, stumps pulled up, and furrows laid on. Irrigation was possible without pumps, using gravity to raise pressure. Production of vegetables built up well, mainly cabbages. There was so much water that water power looked interesting, but that was about all it was. Output peaked at 5 amps with a car alternator and pelton wheel. But by now tons of piping had arrived from a closed mine, so the idea of fish came up. The Government fisheries dept. was supportive, a dam was built, and trout raising started. Elangeni became a small fish farm. Fingerlings came from South Africa. Ponds near the house, raised fish, with a ready market in hotels and restaurants. Well, to put it very simply, the streams dried up! By 1990 the vegetable supply had slowed to nothing and the house supply was well down. The problem seemed to be a climatic one, a bad year or two maybe. But when the streams did not flow even in the rainy season, there had to be a good reason. At first drought looked a likely cause. But the figures did not support that theory. What about bad luck? Well, even farmers can’t blame it all on that! So could the fresh young pine trees all over the grasslands above the farm be the guilt party? These hills, which had been pastures and plough-lands for the local people as long as anyone could remember, had passed to the Usuthu Pulp Co. and been planted to pine the mid 1980’s. At the time it was said that conditions might actually get wetter! Protests resulted in the catchment behind the farm not being planted. In retrospect it appears as if what was termed a ‘concessionary area’ was clearly a wetland sponge. The alleged drought could not go on forever, and on 13.07.1994 S.A.P.P.I, now the owners, were sent a written complaint. Seven months later S.A.P.P.I wrote back, promising research into the problem. This was scheduled to last 2 years. SAPPI’s Environmental Officer mentioned ‘an aggressive planting policy’ due to the poor nature of the soils. This involved planting all stream banks and all wetlands. Trees died off on shallow soils but did well in most areas. Rainfall averages about 1100MM per year. Why So Long in Waking Up? ‘Blinded by science’ is not just a phrase. In 1994 my family was in the United Kingdom, and farming had all but ceased. The ‘pressure was off’, so to speak. In fact the water pressure had been off completely in most of the streams since 1990. SAPPI’s promises of research was sufficient for the time being. So, just when did Peter wake up? Well, in 2004, actually. And why? A chance book purchase at a church bazaar provided a copy of ‘wood and water’ by Prof. C.L. Wicht. While SAPPI was busy doing research into the causes of water loss at Elangeni in the 1990’s, Prof Wicht was talking about similar water loss in the 1960’s, with remedies: Remove the trees! And where was SAPPI’s promised research? Not available in 1997 as promised, nor even in 2007! For Peter perhaps the last straw in the credibility gap was the discovery that SAPPI’s Research Officer, who was apparently looking at Elangeni’s problem with what turns out to be illegal planting; was in the same year, 1994, listed on an advisory panel in South Africa. And among this panel’s regulations was that wetlands and stream banks be left unplanted. This became ‘Guidelines’ for the S.A. forest industry, printed in the same year. What was good for the South African ‘Goose’ was clearly too good for the Swaziland ‘Gander’. Quote – ‘In outlying areas where the impact would be relatively low’ less stringent pollution measures should apply.’ Eugene Van As. MD. SAPPI 1990. Obviously the same went for planting, at least on ‘outlying areas’. In the book ‘Back to Earth’ James Clarke mentions a conference on wetlands held in Sandton in 1980 sponsored by, yes, SAPPI! But then Sandton is not really an outlying area, and by 1989 SAPPI had finished planting up all Elangeni wetlands, which could well be called ‘outlying’. By 2004 farming had long ceased. A letter to SAPPI in that year received a reply just over 3 months later, but by then a legal process had started. It was now obvious that other people’s streams had dried out, and that it was not always drought that was to blame, or at least not the 12 year one suggested. Clear felling started around 2002, the trees being up to 18 years old. Streams began to flow again. Whether this was due to the long ‘drought’ breaking, or to farmer’s good luck, or maybe the disappearing forest next door remains to be determined by a court of law. No support has been offered by either the Swaziland Ministry of Agriculture or the Swaziland Environmental Authority, thought both were approached. F.S.C. was given full details on 03.05.06 at a meeting in Swaziland. Response forms were promised, and arrived five months later. These were returned in Nov. 06, but no reply has been made. A letter of 16.08.07 to Mr. Hellier in UK is unanswered, as is a fax. I understand SAPPI now has FSC certification. The fact that they do not appear to hold a planting permit for block X, the area in question, seems to be of no concern to Woodmark. During a recent conversation, a SAPPI Executive remarked that Peter was thought to have dropped the case for lack of funds. Apart from sound and generous legal advice, no support has been received to date. If matters are to proceed as they should, some sort of support will be needed. Elangeni has deteriorated badly since 1990, but with little left to lose, Peter intends to establish just why the water went away. A Last Quote: ‘Company’s cannot Care’, Richard Spoor, Attorney.